The printable sample bill of sale format is of much use whenever you are going to sell something. A sale is completed with a bill and payment. 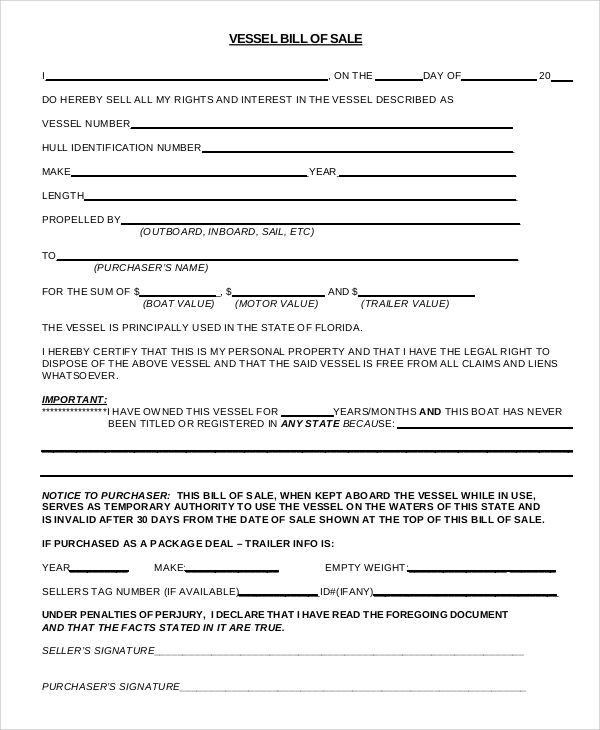 When you are going to sell an item, you must prepare a bill for that item with the full item details, and you must present this to the buyer for getting the payment. For ideas on making different types of bills of sale, you may surf through the various Bill of Sales Samples online. The printable general bill of sale is one of the most typical and general formats, which will give you a full format essential for billing any item. The most general fields are included here for universal use. 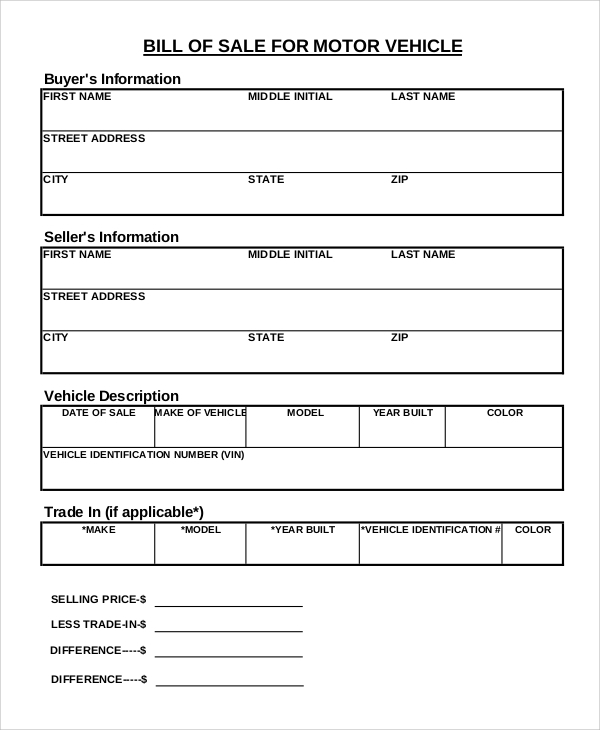 When you are not sure what details you are going to include in the printable bill of sale format, you may start designing or planning with this blank layout. 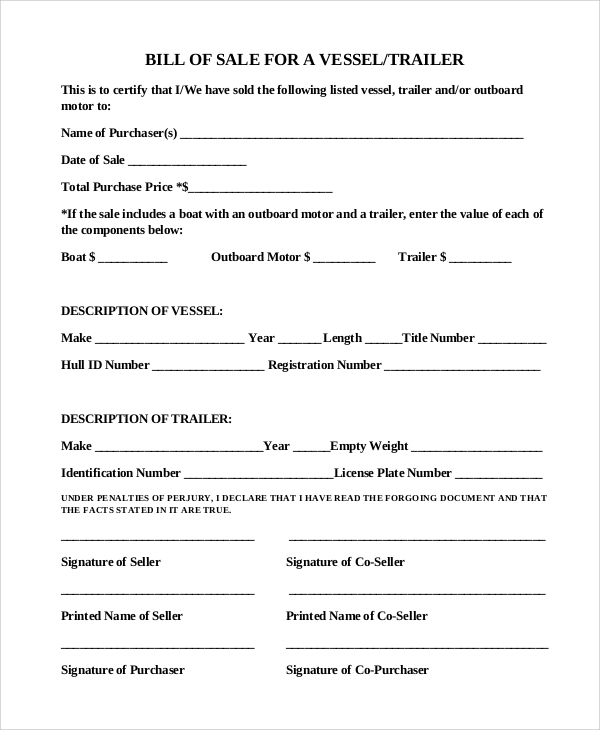 When you are in the trade of selling trailers which are large vehicles, you will need this particular format for making the bill of sale. It is free to download, and you may make a nice trailer bill of sale with it. 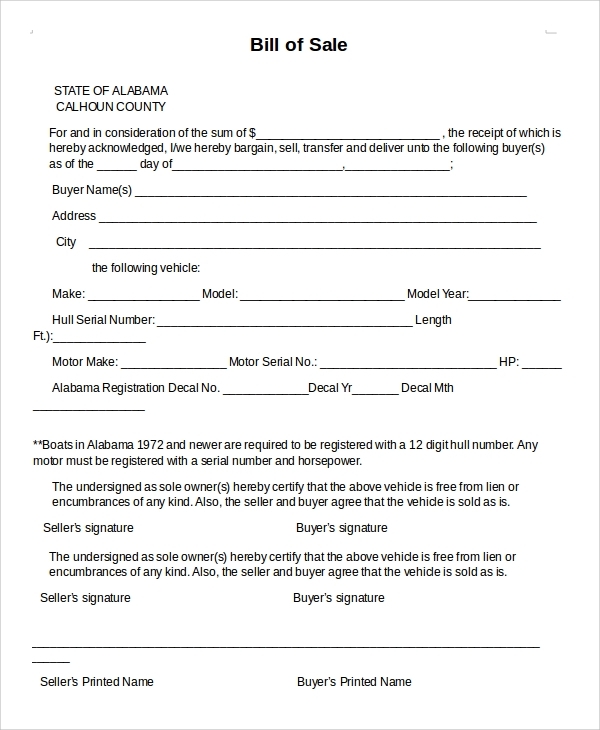 The printable bill of sale for a car is used for car sales only. 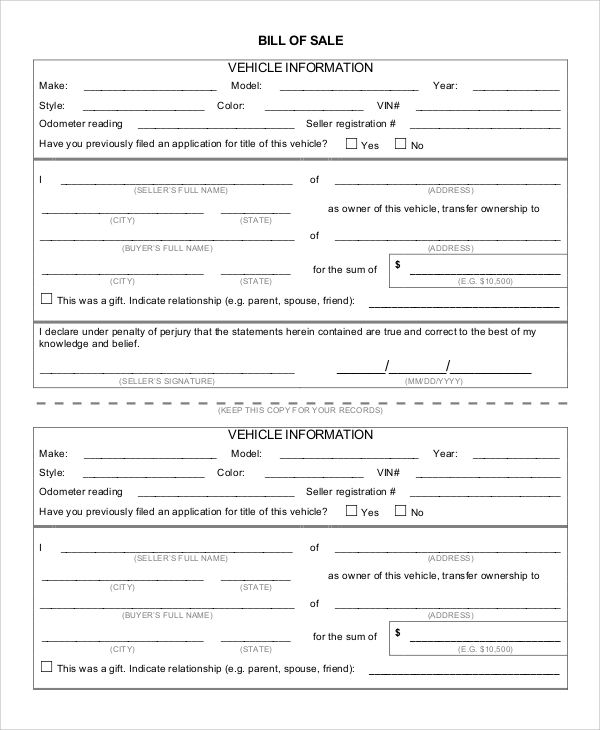 If you are into car sales, you would love to notice in the format, how an ideal and globally accepted car bill of sale is made. 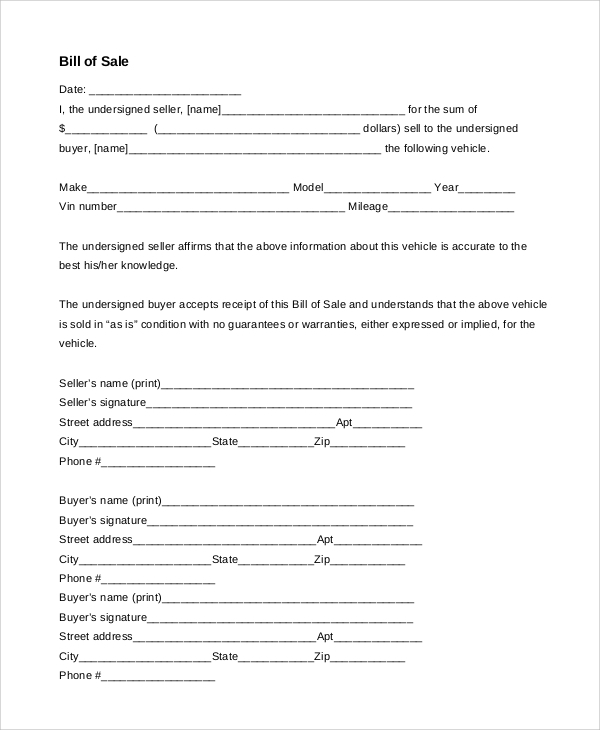 The simple printable bill of sale is an essential bill of sale format and is prepared in the most generic way so that any bill can be made by using this framework. Further specifications can be added later. What Is A Printable Bill Of Sale? The printable bill of sale is used when you have to make a bill of sale for selling some product, and you need a print ready format so that your time is not wasted in making a bill, designing layout, adding fields, etc. You can also see the Vehicle Bill of Sale. It’s a time-saving solution, which most sellers would love to have when they are doing some last hour preparation to start selling, and actually never got enough time or ideas to plan. 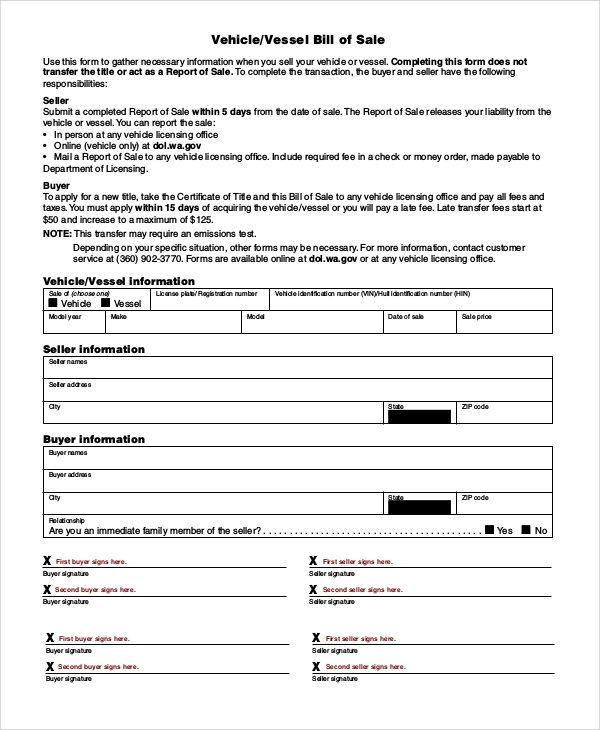 These bill formats are great references too, so that on seeing them you may understand that your already prepared bill of sale format is market compliant or not. There are some great uses of the printable bill formats. You actually can take ideas from the formats, and if you already have a pre designed bill format ready, you may enhance its looks, add necessary fields, and make relevant changes for better looks, by seeing the reference printable bills. 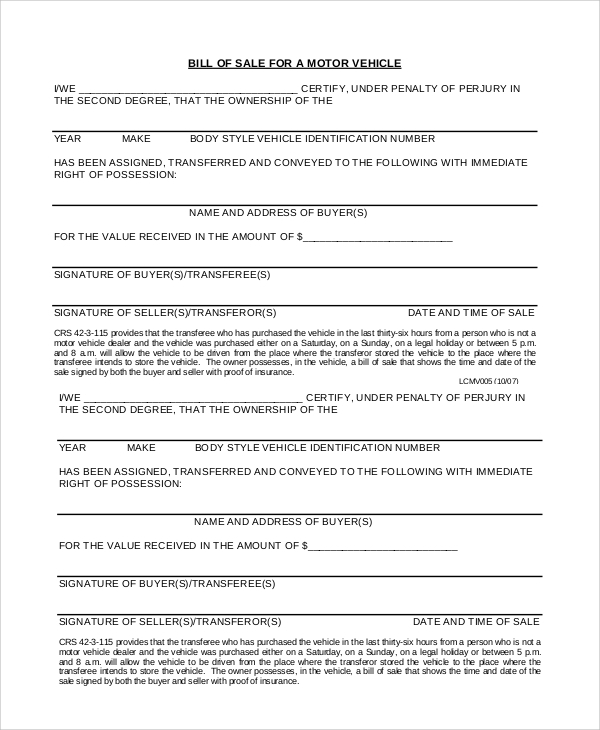 On the other hand, if you are running short of time in designing a bill, you may straightaway download and print a relevant printable bill of sale. Another reason for using them is when you have no clue or little idea about designing your own bill of sale. Whether you use a general style bill of sales, a Sample Equipment Bill of Sales, or some specific style, you can always get relevant help from the online bill of sales guides. These samples will be helping you throughout, and you may get any style of bill making and that too free of cost.